No light meter in the camera, roll your own film. Done and done. UPDATE: It turns out the Leica and 1957 7-element 50mm collapsible Summicron lens (Henri Cartier-Bresson's favorite and most-used lens, by the way) in the top photo is for sale. It is museum-quality—its only flaw is a tiny pinhole (almost too small to see) in the chrome plating on the back left of the top plate, which is however very probably how it came from the factory. The lens comes with box and papers and has a completely clear front element. Probably shouldn't be a user...it's too good to spoil now that it's nearly sixty years old yet still in ideal condition. Contact me if you're interested and I'll put you in touch with the owner. —Mike the Ed. George Feucht: "I did the math and bulk loading doesn't save money, for some reason. A roll of Tri-X is $5. The 100' bulk roll is over $100. For the 18–19 36-exposure rolls you get, it actually costs more to load yourself. Weird, right?" Mike replies: But rolling your own is more of a pain in the you-know-where, so it would be more in the spirit of an M-D, right? Gordon Cahill: "Does it do video? Kinda pointless if it doesn't shoot 4K, isn't it?" Looking into the window of a camera shop (as you do) I saw a Leica M3 body, so I had to have a go. Loved the bright viewfinder, even though there was no lens to try it with. £599 for the body which is probably a good price. And it looked very good for a camera that is probably 50 years old. I'd love to have it but I suffer from chronic GAS (no sniggering at the back, I mean Gear Acquisition Syndrome) and I really must stop. Maybe next time! Been there, done that, ain't goin' back. And darkroom equipment is very cheap now, and much more mechanically satisfying than a computer and ink-jet printer. Ah, my youth (if youth lasts for 40 years). I truly miss all that. I was right there with M's and plain prism Nikon F's. I know, I could still do it. I have everything right down to a Cold light enlarger and I still have Rodinal. Photography without prints is wrong and I'm not printing right now. That needs fixin' right there. Negative Scanner - Oh yea. Noway I'm going to learn all over again to make GOOD prints. Now you can get started. You'd have to use a PILE of film to get that up to $6K! Take you years. And at the end, the camera would probably be worth more than when you bought it... unlike the putative new Leica. Free cameras, what's not to like! I like this suggestion (not that I am tempted by it, it is more like what Ignatius Reilly would describe as the 'proper theology and geometry' of it). [Verichrome Pan, and Medalist paper. But probably a Rolleicord, not a Leica. If my eyes were young enough to focus on the Rolleicord's groundglass. I have an M2 for the OCOLOY, and just for good measure I have just bought an M6 with a .85 viewfinder and a handful of really old lenses... 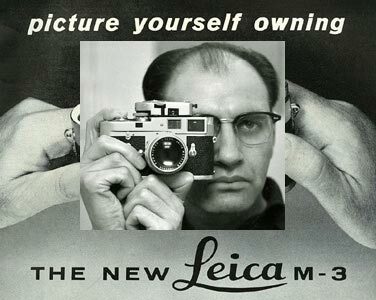 I think in terms of digital, the Leica man should be looking at an SL these days... The SL will cost just a couple of hundred buck/pounds/euros more, and it does everything. Or maybe a Fuji, which does everything in APSC? Even a brand new MA body and a 40 f1.4 CV lens would cost less than a MD body. But what's with bulk TX? It's cheaper to buy 20 factory loaded 36 exp rolls! Perhaps you should have shown a bulk roll of HP5. Speaking from experience, I would agree with Mike. But at the time it cost nearer to $600. I have been so into wet plate lately that I haven't taken it out for a spin. Been there, done that. 1973 - 1978, I think. What I shoot now is so much better for my needs. Mind you, I do still have everything but the camera and lens in the house (including bulk loaders). I was looking at prices in 1981 (Jan 1981 Popular Photography is the earliest I could find on Google Books). The M4p body cost the same as the Nikon F3 body, but the lenses tended a lot higher, even that early. Also, Nikon had the FM body for 1/5 what the F3 body cost -- and I was perfectly happy with FMs, I never had one of the Nikon "single-digit" bodies and didn't miss it. Which is all why I didn't replace the Leica gear when it (along with the Pentax and I think the Yashicamat) were stolen; I got an FM instead. What I probably should have done is pushed into medium format and portraiture more seriously. Been there, done that and still doing that. Never going 100% digital. Rangefinder cameras evoke the same feelings of passion and pleasure for me as bamboo fly rods and side by side and over/under shotguns. I fish and hunt with them as well as with graphite fly rods and pump shotguns. The latter are functional tools and the former are states of mind and being. Not to get all Zen or anything but using the old finely crafted rods, guns and cameras is a completely magical experience. I started with similar cameras. A fixed lens. No light meter. (I was good at guessing, and I still am.) No autofocus. Film, 12 shots at a time, eventually up to 36. Still doing it! But with OM1Ns. There is a film Leica out there with my name on it for sure. Timing is all, as is disposable income! Well, if you attach a Leicavit or Rapidwinder and develop a really fast trigger finger, you will be able to take video clips of 1.5 seconds at 24fps. Resolution is only limited by your film choice, of course. 4K or better is at your fingertips! Real photographers don't use store-bought film. My idea of a traditional Leica experience is to use one of the III series of Leica's. You have to practice, but once you get accustomed to their many idiosyncrasies there is a deep satisfaction in making images with them. My favorite is a IIIf with the collapsible Elmar lens. The shutter is nearly silent and the IIIf is so totally retro that people are not aware that you are using a camera. I carried one with me everywhere (together with a Weston Master IV meter) for several years in my coat pocket. I have an M3 and M4 (and nothing newer) but using them is more of a contemporary and less a traditional experience. Sure it shoots video. Way better than 4K. It just has a slow frame rate. First thought: tri X professional in 35 mm???? Oh, it's just the stupid box. Second thought: Boy do I ever miss bulk loading 70 mm film. I used to be able to get 70mm aerial photography film government surplus for about a dime a foot. The best film ever made in my opinion. Not for me. I'll stick with my Olympus OM-2n. I'd feel silly being caught in public using a light meter. And the rangefinder is a case of several wrongs trying to make a right. If I craved for a film Leica, though, I'd go for the MP. "Probably shouldn't be a user..."
Reminds me of taking a train to London as a 17 year old and seeing a Leica in the flesh for the first time. I thought it was the most beautiful object I'd ever seen. It took me 25 years before I was in the position to buy one. I remember picking out a nice M4-P in a specialist dealer and after looking it over and asking a few questions the owner looked at me quizzically and asked "You're not planning to use it, are you? As he said that, he slid the camera back to his side of the counter. I ended up with an M6 and a Canadian 35mm Summilux. For the record, the body was badly in need of a service and the lens was a disappointment compared with the modern Nikkors I was using day to day. My Leica journey almost ended there but for a burglary at home which resulted in it being replaced with a brand new M6TTL and modern Summilux. Now that was more like it. By that time, film was coming to an end on magazines but I did use it for many cover shoots and those pictures remain among my most favourite. I'll never sell it and when I'm retired that will probably be the one camera I'll keep. Bulk loading film used to be cheaper than packaged film, by a significant amount. My guess is that the universe of film users is so small that producing bulk loading film that is not likely to move fast is just not practical.